Today we are going to study consolidations in more detail. Consolidations are the basis for most swing, day, and momentum energy moves. It is therefore important to recognize the difference between a strong consolidation, a weak consolidation, and a tiny run that may look like a consolidation but is actually not one. In this discussion, we are going to study a consolidation that stepped down then formed a long white candle. These patterns are often “gottcha’s” for retail traders who assume a downtrend or sell short opportunity is present when in actuality, other factors are causing the mild retracement. EME on the chart below has a solid consolidation for the past 4 days. It ran up with 2 gaps and settled in to consolidate just below the previous short term highs in mid October. This pattern is called a “resting phase” which means the stock is resting after moving up quickly. Stocks that rest rather than retrace immediately often have strong energy behind them. Often these patterns form during quiet accumulation periods with large lot institutional investors or traders. The consolidation is nice and horizontal without any up or down action that would be a tiny run. It is building energy. Green Volume bars are stronger than the red volume bars. Yet the next day it forms a broken step, with a surge of red volume or downside volume. Novice traders using the broken step sell short entry signal would immediately jump into a sell short position because they are not studying all of the areas of the chart that need to be analyzed. The next day the stock moves down a small amount and the sell short trader is excited that they are in a good selling down trade. Then comes the “gottcha” the next day. A big white not only wipes out scant sell side profits, it nets the trader a loss on the trade. So what went wrong? Why was the sell signal and volume not enough to determine a sell short trade? First, you have 2 common gaps on the initial run up prior to the resting phase consolidation. Those gaps are common, common gaps fill easily. So the move down was mostly a fill the gap scenario NOT a shift of sentiment. Buyers, big lot buyers had been moving into the stock at the gap level. So as the stock dropped to their bracketed controlled entry price range, their orders were automatically triggered and the stock ran up that day. Notice that the white candle remains contained within the original range between the low of the gap and the high of the consolidation. This is large lot activity triggered by their price range being hit. We often see a good setup with a resting phase consolidation that then turns down weakly for a day or two only to move right back up. This is because in these resting phases of consolidations, the buy side is usually in control. We have seen many of these patterns of late and too often retail traders are caught on the wrong side of the trade, selling short, OR they panic after buying into the stock, sell in panic, and then watch the stock recover as soon as they are out of the trade. Trading profitably takes more than an indicator crossover, or buy signal, you need to really study what has occurred recently and take that into consideration as well. You need to know who is buying, who is selling, and why the consolidation formed in the first place. Then you will know the true breakout direction for that consolidation. During the first segment of this popular four-part webinar series, Nicole covers underlying stock analysis and news events. Parts 2, 3 and 4 will focus on critical aspects of options trading. Part 2 continues with determining your outlook on implied volatility and part 3 demonstrates how to align your outlook with the option greeks. In part 4, Nicole will bring everything together and provide a time saving tool to whittle down 40 option strategies to two or three potential candidates. Nicole Wachs is TradeKing's director of education, where her goal is to provide the best content possible in order for TradeKing clients to become better traders and investors. Prior to TradeKing, Nicole was an Option Specialist, Market Maker and Trainer for Goldman Sachs, trading options, equities and index products as a member of both the American Stock Exchange and the International Securities Exchange. Nicole has been quoted in Bloomberg, SmartMoney magazine, Barron's and other publications, and appeared on Fox Business News and CBOE.com. She holds a Series 7 license and has formerly held the Series 3, 55 and 63 licenses. Often times traders will ask me how to streamline their stock pick selection process. To many times I hear traders say they are spending many hours trying to find stocks to trade for the next day. Trading shouldn’t consume your life, even if you are retired or doing it full time as a career. Remember that every hour you spend trying to trade or find stocks to trade is costing you money. Your time is money. Consider how much your hourly wage is or was, then think about how much time you spend on trading. Then think about the amount of money you put in your account as profits versus the hours you have spent. Are you really making money? Or are you doing this for a hobby? Your profits should equal the same or better hourly rate as your prior profession. If not, you are doing several things incorrectly. You are making common mistakes that drag retail traders down into the trading bog without them even realizing it. One thing you must learn to do is to make everything about trading efficient, time constructive, and cost effective. Trading as a career is a business so treat it like a business. If you are trading as a hobby and are not serious about making money, then you don’t need to read any further because I have nothing that can help you. A watchlist is a SMALL list of stocks that you watch for an upcoming entry. Watchlists are critical for all trading styles: day trading, swing trading, momentum trading, position trading, and yes even long term investing. Building a good watchlist requires understanding what you are doing in terms of your trading style. Often times traders are simply meandering about trying to find a stock to trade that will make money rather than being organized, structured, and have a complete process for trading step by step. The watchlist we are going to discuss today is for very short term trading, either swing or momentum. Often times stocks will show up that are already moving in a run up or a run down and the entry is not ideal. The risk to reward ratio is not sufficient to net good profits. Most traders get frustrated, irritated, or despondent as they see stocks running while they are not in the run. Instead of getting upset, put the stock on your swing trading watchlist. Then wait for the retracement and enter at the better entry where the R/R is significantly higher. By taking a few minutes to put a stock symbol on your watchlist, you are saving time. You now have a stock you know is moving, and you can watch for a better entry which lowers your overall risk. During momentum and velocity market conditions, watchlists for short term trading are crucial as runs move so quickly you must have your stock picks ready to go before they start the run. CONN is a good example of a stock that would be something to consider for a Swing style watchlist. It has accumulation going on, is moving in a peaks and valleys trendline pattern, and has plenty of upside run gain potential. Right now it is overextended with a long wick and is near a bottoming resistance level. But this stock has clearly shown lively action of late. So it is a watchlist candidate. MetaStock U - "Indicator Extreme Patterns when Selling Short"
Last week we talked about failed oscillator patterns. This week we are going to discuss indicator extreme patterns when selling short. Right now the market is moving down due to overseas selling and concerns about the Euro risks. Selling Short in this kind of market condition allows you to take full advantage of all of the trading opportunities available in stock trading. Selling short however is not just a mirror opposite of buying long. Once again, the Market Participant groups and who is in control of price makes a difference on how price moves, how indicators behave, and how you should enter and exit a stock. Your goal should be consistent profitability over time. Most traders settle for inconsistent results that at the end of the year end up being either a tiny profit or a loss for all the time and effort you put in. Let’s take a look at an extreme pattern on TechniTrader® indicators for MetaStock. We have SWKS which has been in a downtrend since early 2011. It had an acceleration of selling over the past few days. The angle of descent is at an extreme and the number of down days exceeds the normal number for this stock. But the truly telling signs are what is occurring with key indicators. TechniTrader® Volume Accumulation TTVA and TechniTrader® Flow of Funds TTFF are at the lows of their respective charts. These are extreme patterns, indicating an oversold condition. TechniTrader® RSI/RSI, the appropriate price oscillator for these market conditions is within striking distance of its lower line and the angle is steep. TTVA and TTFF are lower on the chart, at extreme lows well beyond the lower range for both indicators. This means this stock is way into oversold territory. The TT RSI is hovering just above an extreme reading. The risk is not that the stock won’t move down another small amount BUT that when it bounces and moves up, the bounce could either be a gap, or a big early morning run either of which would wipe out most of the profits of this lower end trade. All that needs to happen to have a gap or long white form is some good news before market opens. Since this holiday was a sell down prior to the holiday and on the half day Friday, this increases the risk of a bounce for stocks selling down into extreme oversold territory. Extreme indicators warn of an impending bounce or run up. The support level is shown on the weekly charts. The goal is to exit a swing trade BEFORE the bounce or run up, not after the bounce has occurred. The proper exit day to insure control over the exit price was Friday, holding until Monday in hopes of another half point to point gain on this trade is gambling. The indicators were already into extreme mode. To risk many points to gain possibly half a point is simply poor trade management. Watching the indicators, calculating risk versus profit potential based on support levels, and exiting the trade while it is moving down is the ideal way to exit a swing trade sell short. Summary: We have a different market structure than we had even a few years ago. Without the uptick rule, sell side action goes into extreme mode very quickly. Being able to see the patterns and exit as the stock is continuing to move down but is in an extreme mode is the proper way to capture profits. Otherwise you will be frantically trying to get out of the trade while the markets run up. Sure, this trade could go down a bit further, but the risk exceeds the profit potential. Always trade with the profit potential at 3/1 or 4/1 ratio. Trend analysis can be very simple when utilizing the inherent benefits built into candlestick analysis. The visual aspects produced by candlestick signals and patterns dramatically improve an investor’s ability to correctly assess the direction of the general markets. The Buy and Hold investment philosophy has not worked very successfully over the past two decades. Why? Because most money managers work off of a very simple premise. Buy a good strong company and hold it for long-term. You will do well. Unfortunately, they disregard one of the basics truths of price movement in the markets. Prices do not move based upon fundamentals. Prices move based upon the perception of fundamentals. There are many clear examples why fundamental analysis is not a primary factor for analyzing market trends. For example, at the end of 2007 analysts were recommending stocks such as US Steel Corp. at $180 a share because it was a fundamentally strong company. That analysis does very little for an investor when the price falls to $20 a share by the beginning of 2009. It is not the fundamentals of companies that move stock prices up or down. It is the investor sentiment pertaining to a stock that dictates whether it moves up or down. Candlestick analysis provides a very clear indication of what investor sentiment is doing in the markets. Japanese rice traders used the same information found on a standard bar chart. The difference is that they put more weight on the open and closing prices versus the high and the low of a time period. As illustrated in the US dollar chart, candlestick signals produce reversal signals that create a high probability that a new trend has occurred. The one basic factor built into Japanese candlesticks signals is that they are formed by the cumulative knowledge of all the investor input, the buying and selling, of a trading entity during a specific time period. No matter what you hear elsewhere about the direction of the market, candlestick signals tell you ‘exactly’ what investor sentiment is doing. Candlestick analysis allows investors to project market reversals with a relatively high degree of accuracy. This can be done when utilizing the 12 major candlestick signals. One misconception about candlesticks signals is that there are too many of them to learn. In reality, of the 50 or 60 candlestick signals, there are only about 12 signals that will occur a vast majority of the time. The Doji, the Bullish and Bearish Engulfing signal, the Hanging Man, Shooting Star, Hammer, the Bullish and Bearish Harami, the Dark Cloud, the Piercing pattern, and the Kicker signal. Although they may not sound sophisticated, the Japanese rice traders named these signals to make them easy to recognize as well as to understand. Knowing what the signals represent will dramatically improve your analysis of trend reversals and movements. Japanese Candlestick signals incorporate an extensive amount of information not found in other trading methodologies. Hundreds of years of observations not only allowed Japanese rice traders to successfully identify accurate reversal patterns, they could also describe the investor sentiment that formed the signals. This knowledge is a very accurate tool for projecting the next move in price. It is simplified for all investors, whether a novice or a professional investor, to greatly enhance returns. Identifying long established, statistically proven reversal patterns, as well as knowing how they were produced, provides a very powerful investment tool. Buy low, sell high. Amazingly simple! This should lead to a simple question. Who was buying when everybody was panic selling and who was selling when investors were running prices through the roof? Fortunately, these questions have been asked for centuries. Visual observations recognize the existence of fear and greed. Japanese rice traders recognized reoccurring patterns that depicted the reversals in trends, utilizing the price movements preceeding a major trend reversal. A candlestick signal formation has one major aspect that makes it more powerful than all other technical analysis. The signal is the result of the change in investor sentiment. This statement will be repeated for effect. The signal is the result of the change in investor sentiment. Not the anticipation of a possible change! The actual result is the change of trend direction. Having this as an investment tool can dramatically change an investors ability to maximize profits while reducing risk exposure. It allows the average man or woman investor to invest with the same temperament as the professional trader. Buy at the bottom, sell at the top. Pretty easy, right? Yet where does one grab the falling knife? When is high too high? Candlestick signals alleviate that problem. A candlestick ’buy’ signal, appearing after an extensive decline in a stock price reveals compelling information. ( All trading entities can be effectively analyzed with candlesticks. The term “stock” will represent all trading entities.) . This information inherently benefits investors, making for comfortable trading decisions. The basic function of investing is to make money. However, few investors develop a trading program that put the probabilities in their favor. If searching for the “Golden Goose” of investment programs, the criteria would be simple; well researched, proven track record, and easy-to-identify reversal points. All three of these elements are incorporated into Candlestick signals. Hundred of years of rice trading resulted in the identification high probability profitable trades. Make one assumption. The signals would not be around today if it were not for one convincing result. PROFITS! Candlestick signals exist today because of hundred of years of actual profitable trades. Not computer back testing. Not questionable results. Profits produced from utilizing the signals are the only reason we are witnessing these signals today. Reversal signals were identified by rice traders using very simple charting techniques. You can take advantage of these clear profitable signals? Trend analysis becomes much easier, as illustrated in the NASDAQ chart. The Doji, followed by a gap down, provides strong probabilities of a downtrend. The Bullish Engulfing signal, when stochastics are in the oversold condition, provide high probabilities of an uptrend. The non-signal after the first downtrend implies the possibility of some buying coming into the market but not any decisive trend reversal. As seen, the next two months consisted of indecisive waffling in a trend channel. As in any investment program, the underlying motive is to find characteristics that place the probabilities greatly in the investors favor. Logic implies that when you witness a Japanese candlestick “buy” signal in an oversold condition, you should have an extremely high probability that a bullish trade will be profitable. Oversold conditions can be defined as to when stochastics are in the area of 20 or below. Being able to add other conditions such as moving averages, Fibonnacci numbers, trendlines and trading channels, to a Japanese candlesticks signal in oversold condition only enhances the probability of making a correct trade. Putting all these observations together provides a compelling platform for market timing strategies. Utilizing the information from high probability patterns also allows investors to make a relatively accurate assessment of the market direction. Beginning in August of 2011, bullish Harami's indicated the end of the downtrend. The following eight weeks revealed an indecisive trading pattern called the Dumpling Top. The inherent trading forces build up in a dumpling top indicate a hard downtrend is about to follow. This can be seen in the dumpling top form in the Dow during the summer of 2008. Conversely, when a strong pattern is breached to the upside, the force of the upside move has to be substantial to offset the potential force to the downside. As witnessed, the breach of the upside rounding top trajectory would imply a very forceful breakout. Having this analysis capability in your arsenal allows the candlestick investor to have their portfolio positioned in the correct direction when a move occurs. Understanding the psychology of how the signals are formed provides investors with better foresight in where to have positions placed. The signals in the last week of January created the opportunity to add short positions to the portfolio whereas the signals in the first week of February produced high probability signals that would have covered the short positions and added long positions. This is not rocket science. This is simple investment philosophy’s put into a visual graphic. The 400 years of actual investment results from Japanese rice traders have provided high probability signal results. The candlestick signals illustrate the investor sentiment, mostly defined as fear and greed. Human emotion, when it comes to investing funds, will always have the same ingredients. The candlestick signals are simply the graphic depiction of investor sentiment. Candlestick signals were not discovered and tested by computer back testing simulations. Candlestick signals are the result of centuries of analyzing what human emotions effect a price trend. The occurrence of the signals, over and over, at specific points in a trend-reversaI, provides a statistically proven trading platform. If you understand how they are formed, you’ll understand what makes prices move. About Stephen Bigalow Stephen W. Bigalow is author of “Profitable Candlestick Investing, Pinpointing Market Turns to Maximize Profits”, “High Profit Candlestick Patterns” and “Candlestick Profits, Eliminating Emotions” is also principal of the CandlestickForum, the leading website on the Internet for providing information and educational material about Japanese Candlestick investing. Over 28 years of extensive study and utilization of candlestick analysis has produced an array of easy-to-learn educational material about Candlesticks. As one of the leading Candlestick experts in the nation, Mr. Bigalow, through consulting with major trading firms, has developed multiple successful trading programs from the day-trader to the long-term hold investor. Have you ever wanted to know what all of the letters in the Time & Sales feature of QuoteCenter mean? If you answered "Yes", to the previous question this article is just for you! Below you will find a quick reference guide for meanings of all the letters in the Time & Sales area of QuoteCenter. 1) Clink on the TAS link. This is found under the Reuters Navigator menu. 2) After clicking on the TAS link, the following screen will appear. 3) To investigate what the letters under the modifier and exchange columns mean, you need to open up an analytics window. To do this, go to "Edit", select "Add Display", and click on "Analytics". 4) After opening the analytics window, you can search for modifiers by entering [mod or exchanges by entering [exch. 5) Click on the red area next to the corresponding country (for exchange searches) or beginning letter of the modifier (for modifier search) to learn more about the letters in the modifier and exchange columns. Have you ever tried to open a chart and for some reason the price bars weren’t displayed? If so, watch this short how to video to quickly get you back up and running. Thank you to all of you who wrote me to tell me how much you enjoyed last week’s MetaStock and TechniTrader Webinar on “Riding the Momentum Out of a Bottom.” The webinar can be viewed on our site with the work booklet. One of the things I spoke about during the webinar is the Science of Trading which is what MetaStock Charting Software is based upon. This concept is something you should embrace as it is the basis for chart analysis. It is easy to get caught up with the news on the internet. You can’t go anywhere and not run into news and reporters commentary. As traders, it is essential that you not get caught up in that emotional chatter. 2. Is there sufficient volume and activity to drive price up and sustain price? 3. Is the ANGLE OF ASCENT OR DESCENT too low, too steep or angling at a rate that is sustainable for that particular trend: primary, intermediate, or short term? 4. The Market Condition: where most stocks are in the general cycle: platforming, topping, bottoming, consolidating, trading range, moderately trending? You need to know this in order to determine what trading style will work optimally and what indicators to use. During my webinar one attendee wanted to know why I wasn’t using stochastic when I was teaching about momentum runs out of a bottom. Stochastic is ideal for trading ranges. It is fine for platforms but it is not the indicator for a momentum run out of the bottom. Why? Because momentum causes the oscillation of stochastics to fail. It is designed for sideways market action not momentum action. Below is a prime example of why you should not use stochastic in a momentum bottom. Stochastic shows an overbought condition at the end of October, just as momentum starts in this stock to propel it out of its bottom. So, if you were using Stochastic as you are taught by most seminars, this would have been an exit point. Since Stochastic floats during a momentum action, there was no trough to tell you to buy back in for the momentum move. However, with the TTQA, even though price is not moving at first but resting, we can clearly see momentum building before the long white candles. Using the wrong indicators for the current Market Conditions is the most common mistake traders make. This one mistake or lack of understanding and education, costs retail traders the bulk of their profits. It is the reason most traders chase stocks, why they enter a stock too late, why they take chronic losses, and why they are so frustrated much of the time. Do yourself a big service, learn what indicators to use in each market condition. Your profitability will increase dramatically if you do this one thing. 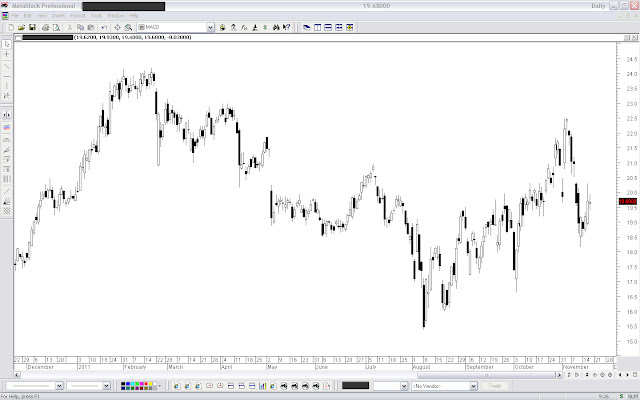 During this 60-minute webinar, originally presented on 11/16/11, Greg Morris demonstrates his MetaStock add-on "Japanese Candle Pattern Recognition." Find out more about "Japanese Candle Pattern Recognition" here. Many traders have already discovered that Japanese candlesticks allow them to see data more comprehensively at just a glance, but they often ignore critical variables. Though many candlestick products exist, they don't offer detailed pattern recognition and filtering, and they don't use correct methodology (original Japanese). Greg Morris, Western candlestick pioneer and author of "Candlestick Charting Explained," has partnered with MetaStock to develop the Japanese Candle Pattern Recognition Add-on. This recent addition to the MetaStock line offers accurate identification of REAL Japanese patterns by employing advanced filtering capabilities and Greg's extensive knowledge on the topic. All the patterns in the add-on (except 2) are true Japanese patterns based on the extensive research conducted by Greg Morris with original Japanese literature. This new method of identifying trends takes into consideration the true range of prices and expands or contracts based on those ranges. This allows it to follow the trend adaptively and with greater accuracy. By automatically calculating the support and resistance lines, this feature allows you to increase the look back periods and expand the concept. Based on a wealth of experimental data (7275 common US stocks, which included large data histories that totaled over 14.6 million days of data), this critical function scores the probability that a reversal trend pattern will be successful. "I attended a Market Technician Association seminar in Phoenix, AZ in 1988. There was a large contingent of Japanese traders present and they presented their charting techniques. It was the first time I had ever heard of "Hi Ashi," which is what the Japanese call their candlestick chart. I was working with N-Squared Computing then and we decided to create a charting product using Japanese patterns with automatic recognition capability. I traveled to Japan and stayed with Takehiro Hikita who was an active red bean and rice trader in Yokohama. He was intent on teaching me the art and also helping in translating several books. There are many books out now on candle patterns and most software programs have candlestick charting capability. However, very few have the correct methodology (original Japanese). This product uses ONLY the candle patterns that came from original Japanese literature, with two exceptions. The Three Outside and Three Inside patterns were created when I was at N-Squared Computing to enhance the Engulfing and Harami patterns. They do that quite well, but please realize they are NOT real Japanese candle patterns. Note: I find it amusing that in new books on candlesticks, the Three Outside and Three Inside patterns are generally included as if they are actual Japanese candle patterns. I think only Steve Nison and I did any original research, the rest obtained their knowledge from us. For additional study I humbly recommend you refer to the 3rd edition of my book, Candlestick Charting Explained, published by McGraw-Hill. I cover all of the patterns included in this product, the single day patterns, and many others that were created to fill holes in the Japanese literature. This product follows closely the details laid out in the book. The book was first published in 1992 and is on its 3rd edition with a vast amount of statistics." Martin J. Pring entered the financial markets in 1969 and has grown to become a leader in the global investment community. He founded Pring Research in 1981 and began providing research for financial institutions and individual investors around the world. Since 1984, he has published the InterMarket Review, a monthly market letter, offering a long-term synopsis of the world’s major financial markets. Hey candlestick fans... we have a little challenge for you. Take a look at the chart below, a bare bones MetaStock candlestick chart of an unidentified security. We snapped it yesterday morning. So you tell us. What does this chart tell you? Would you buy, sell, or hold... or what? Why? Don't be shy. Give us your comments below. We will publish a follow up in a few weeks, and identify the security... and the most accurate response. No prize involved, just bragging rights. What would YOU do with this information? 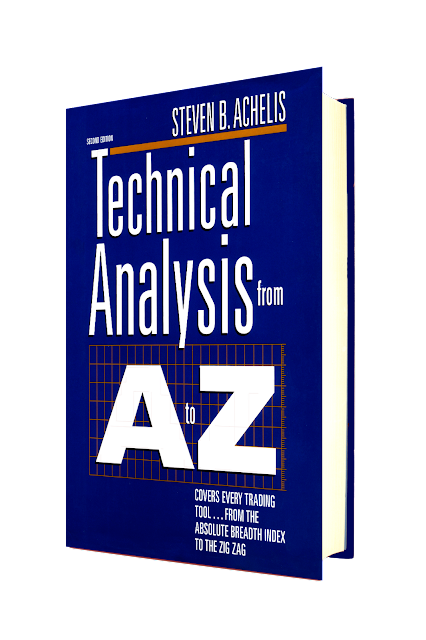 If you are attending the Money Show in Las Vegas today (11/17/11), be the first to come by the MetaStock booth and mention this post and get a FREE copy of Technical Analysis from A to Z -- a $40 value. In this 60-minute MetaStock guest speaker presentation (originally presented of 11/10/11), Tom Busby, discusses how to use one of the best, but little-known leading indicators in the financial markets...the S&P Futures. While some traders only have a vague understanding of how the S&P futures can be used to time entries and exits, you will come away from Tom's webinar with a practical and proven method that you can immediately apply to your own trading. The MetaStock Forum: 12607 members strong and your best first stop for questions about everything MetaStock. Check out our most popular thread regarding "summing things up." 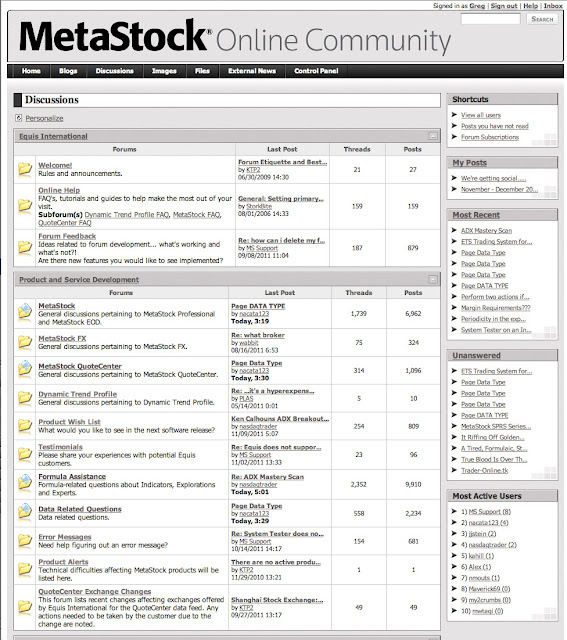 The MetaStock Forum... 32,991 post full of MetaStock and general info on Technical Analysis. We're coming to Australia... mate. Find out more about this event here. Download your MetaStock Holiday Catalog Here. 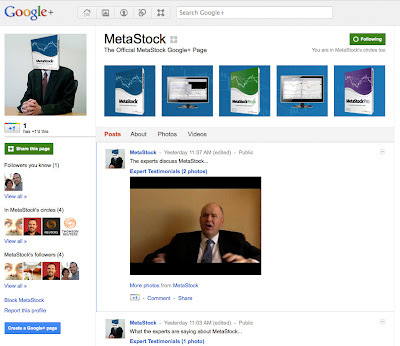 We launched out MetaStock Google+ Page, a new way for you to keep up-to-date with your MetaStock community. We’d like to invite you to add us to one of your circles. By adding MetaStock's page in one of your circles, you'll start seeing updates from the MetaStock team in your Google+ stream. You’ll also have the opportunity to engage with other bloggers by writing comments on the posts. Lastly, be sure to mention +MetaStock when you share your own tips -- if we come across something particularly helpful, we may reshare it. MetaStock SPRS Series - Week 41 - TechniTrader® Weekly Discussion for MetaStock Users: MDAS - November 7, 2011 By: Martha Stokes C.M.T. This stock has an unusual bottom formation. It is a base that has settled into a platform than has recently compressed, which tends to indicate a big move up before it occurs. MDAS gapped down last March, probably on a weaker earnings report. Then it shifted into a long consolidation, and then stepped down into another longer consolidation. What you should have noticed about this current platform is how much wider it is than the previous 2 consolidations. The price action has become far more active and quiet accumulation starts in September. This means this is probably going to breakout to the upside sometime in November. The solid platform defines a bottom even though it is rather unusual. TechniTrader® RSI/RSI shows that the platform has improving price over price action during the platform and is still improving even now. The TT volume oscillator show consistent volume patterns during the early stages of the platform and a resting pattern at the moment. Resting patterns often occur prior to breakouts. The weekly chart shows that this stock has ample upside point gain potential for a good position trade. It is a young company only a few years old. 1. It is under 3 years old. 2. It is in the Computer Software Industry in the Sector: Healthcare Information Service which we know is going to be a big growth sector for the software industry in the next few years. 3. It has institutional ownership around 75%. 4. It is around 10-12 dollars a share. 5. It is widely held by institutions with 150 different institutions holding as of 9/30/11. 6. It has 5 giant funds in the top 10. 7. Revenues have been increasing quarter over quarter and earnings negative is shrinking. So between the technical analysis and the fundamentals, this stock should move up. 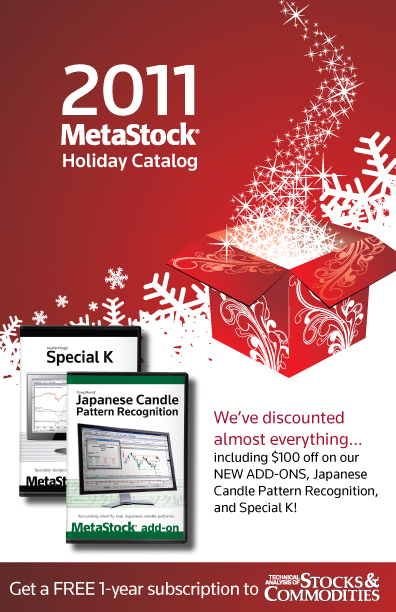 Today is the last day to get a discounted MetaStock 11 upgrade + $100 off Japanese Candle Pattern Recognition. Call (800) 509-8990 or chat. 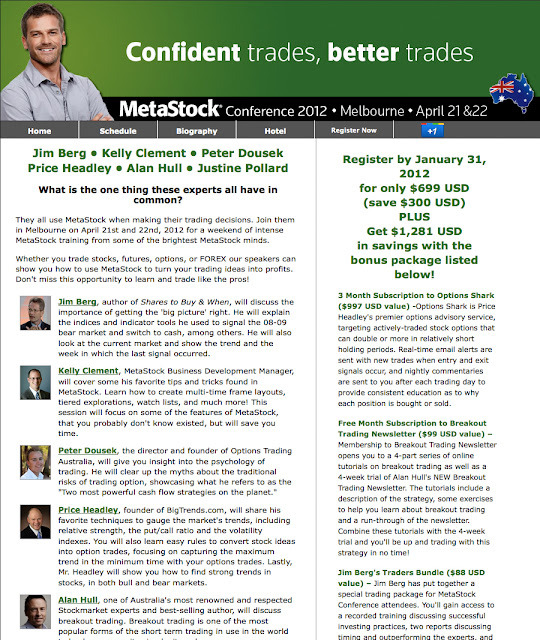 Today is the last day to get early-bird pricing to the MetaStock Conference 2011 in Las Vegas. Call us at 800-466-6509. Singapore Residents. Say Hi to Alex and Jeff at the MetaStock booth @ "Asian Trader & Investor Convention."